The magnificent handcrafted Meenakari pieces of jewellery are popular worldwide for their ethnic designs. They are the wonderful result of devotion and traditional artwork that moves from the several skilled artisans hand. Meenakari is not just jewellery, its the heritage of Iranian craftsmen and Mongols who spread it to India. 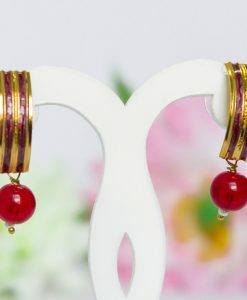 Jaipur (Rajasthan) and Delhi are the places that are still generating the magic of Meenakari for all lovely women out there whose entire traditional outfit appearance is incomplete without this jewellery. The precious metals are utilized as a base for your favorite jewellery, mineral powders are used for coloring and finally studded with precious stones.